Wolves will travel to drink from a river. But could the presence of wolves lead a river to change its behavior? 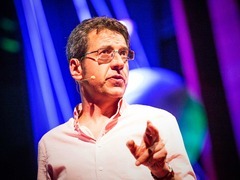 George Monbiot: For more wonder, rewild the world In his TED Talk, George Monbiot poetically explains how reintroducing wolves to Yellowstone National Park after a 70-year absence set off a “trophic cascade” that altered the movement of deer, sent trees soaring to new heights, attracted scores of new animals to the area (think: beavers, rabbits, bears, bald eagles and more), and stabilized the banks of rivers making them less susceptible to erosion. Above, see that story set to music — and howls — by SustainableMan.org, who took the audio track from the talk and laid it over beautiful nature footage. It’s a glorious glimpse of how deeply the natural world is interconnected. If you love this short video, definitely check out Monbiot’s whole TED Talk too. In the talk, he shares some ways we can get more involved in the re-wilding of the world … and why it matters to all of us. Pingback: Tiger Diary: what to expect in February 2015 | Richard Ashworth's Feng Shui Diaries. Incredible video. This just shows how everything in nature is connected. To think that a small group of wolves could make such a major change in the ecosystem. I understand that trees would grow more as more deer were hunt down and away from some areas but it didn’t cross my mind on how that could impact the arrival of more animals, not to mention the change in the behavior of the environment. Ted Hall does have a point about the impact of the forest fires that occurred approximately 22 years ago but as in everything else, a lot of varieties and small events do help in building up an area so it’s not only the wolves’ work that provided the results, but their impact was extraordinary. I’m all for wolf reintroduction in many places, and this video is pretty amazing, but this specific theory has been fairly well refuted. At least has shown to be gross embellishment at the very least if not outright misrepresentation. thanks jamie for the link… certainly LD Mech is no slacker on wolves. However, i don’t believe that “fairly well refuted” would be as accurate as your second comment about a propensity to champion one side of the data gathering efforts over the other. Such ecosystem-level, multi-trophic level ecological studies are always complicated as one attempts the diverse and often conflicting variables. Work in such “natural” settings must always ‘sacrifice’ control (over variables) in favor of improved realism. That said, there are many bottom-up factors (nutrients in system post fire etc.) and other top-down factors (fire, increased numbers of bears). so, what we are looking at is a dynamic system and the answers will remain illusive. That said, bringing systems back to conditions closer to their original intact state is nearly always a positive step and wolves are without question a part of the balance as are the other top predators. good comment and great link. thanks jamie for sharing that. Hey the movie is not available anymore. Check http://sustainableman.org/how-wolves-change-rivers/ for the original movie. This guy is obviously not from Yellowstone. Those are not deer, they are elk. Other factors could have also led to the regeneration of Yellowstone vegetation. Like maybe the huge forest fires in the park 22 years ago. After the fires the grass grew back stronger, the trees quintupled and the Elk could feed easily at higher ground. Which they prefer. But you can credit the wolves if you think that is better. i think the video overlay over the speech was the artist’s rendition and not revealing of the speaker misidentifying elk as deer. But your point about the fires as having a huge impact that compliments those of the reintroduction of top predators is a major comment. its a complex system and all these parts play a role. your point is solid on the importance of fire regimes and other bottom-up (related) impacts. Now, if only politicians would start paying attention to science …..
amazing how one animal can inturn influnnce almost the entire ecological system. That is a fantastic video. The only absolute rule in science is that everything always gets more complicated. The Yellowstone wolf trophic cascade has captured my attention for years and I have used it to teach about the complex interconnections of nature. I will probably continue to use it as it is one of the most well documented trophic cascades ever studied.